A.L.M. Consulting Engineers design goal is to specify and design the most practical, cost-effective systems for your unique project. We take the time to do extensive field work to evaluate the existing building and building systems to develop comprehensive engineering design solutions. A.L.M. Consulting Engineers has an inventory of data loggers, poly phase recording power meters, air flow hood, hydroponic pressure gauges, air pressure gauges and other measuring and metering devices to determine mechanical system performance and energy use. We also employ the technical personnel capable of installing these devices and provide mechanical system evaluations, including, but not limited to; servicing and repairing of mechanical systems. 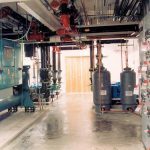 We have provided mechanical engineering designs for new construction and to retrofit, modify and replace over one thousand mechanical systems since 1993. View our gallery of projects.